This interesting webinar organised by the American Geosciences Institute will take place on January 26, 2018 at 11am EST. 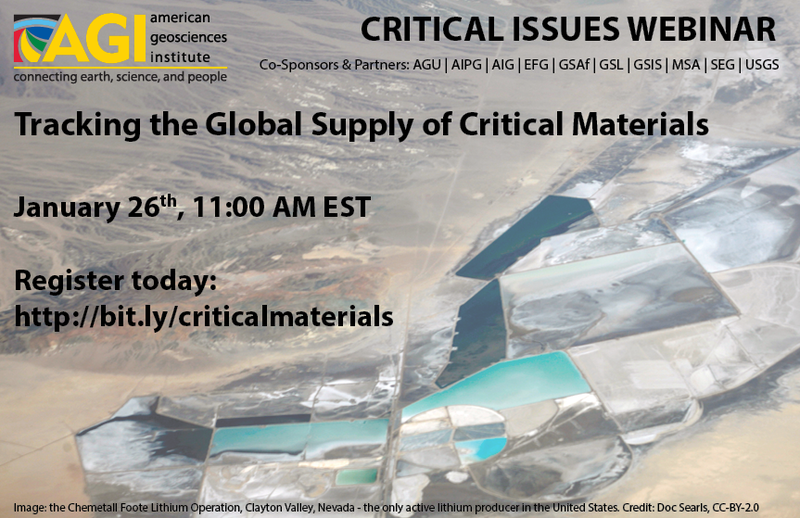 Vitor Correia (President of the European Federation of Geologists and Coordinator of EU’s INTRAW Project) and Ph.D. Nedal Nassar (Chief of the Materials Flow Analysis Section in the National Minerals Information Center at the U.S. Geological Survey) will be the speakers in this unique opportunity to get an insight into the global supply of critical materials and the challenges it is facing. No country in the world produces all of the mineral resources necessary for modern society. International trade plays a critical role in providing these raw materials, forming a global network of production, export, import, and use. Vitor Correia and Ph.D. Nedal Nassar will focus on U.S. and EU efforts to gather information and develop tools that can be used to ensure a secure national and global supply of mineral resources; identify and quantify vulnerabilities in this supply; and stimulate national and international co-operation, education and outreach, and innovation in the development, recycling, and substitution of key mineral resources. Vitor Correia will present the INTRAW Observatory set up to foster international cooperation on critical raw materials.